Will Donald Trump Reveal Who Killed JFK? 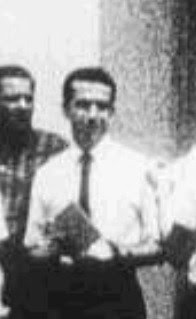 Which Cruz Was Photographed With Lee Harvey Oswald? A Manufactured Distraction? In the most bizarre of weird Presidential election races ever, another strange twist just occurred this week. 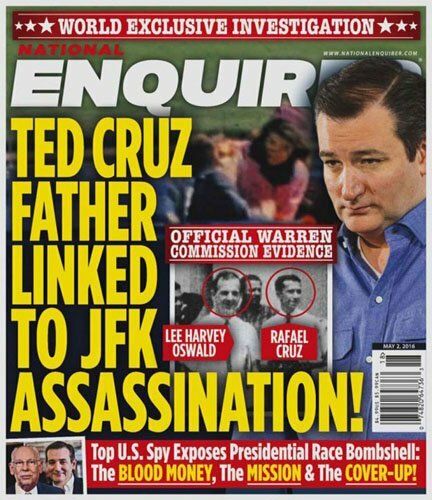 The National Enquirer, a tabloid with a tabloid mentality, has published for May 2, 2016, a “World Exclusive Investigation” in which they have tied a famed incident running up to the John F. Kennedy assassination to Ted Cruz. 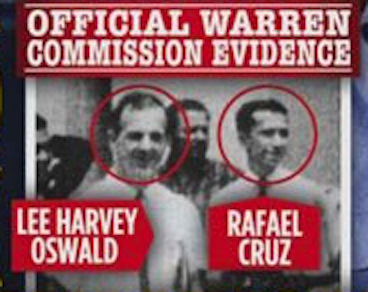 The claim is that Ted Cruz’s father, Rafael Cruz, was photographed with Lee Harvey Oswald in New Orleans. It is as if this story is being floated to get these rumors out there to overturn them, or make them part of the fringe. Most conservative and rightwing blogs are taking the National Enquirer story with tongue firmly in cheek. But is a deeper truth being hidden? Some feel that’s what may be happening here. What might be the realities being revealed in the midst of this supposedly “tabloid news”? Cuban Rafael Cruz, a pro-Batista, CIA connected Cuban in exile met his wife in New Orleans (home of Oswald, Guy Bannister, David Ferry, Clay Shaw and the great Jim Garrison). New Orleans was ground zero for the CIA’s Cuban manned “Operation Mongoose”, the Bay of Pigs and as we all know, the JFK Assassination. Anyone familiar with the assassination and the works of Mark Lane, Jim Garrison, Jim Marrs and David Lifton…and many more will be stunned by this troubling information. Rafael Cruz fled to Canada shortly after Kennedy’s assassination to work in the “oil business”. The oil business? Like Zapata Oil, the CIA front company run by George Herbert Walker Bush? Yeah, that oil business. Rafael Cruz returned to the United States after Nixon had been elected and the Bay of Pigs/JFK Assassination was put to rest for a while. He returned illegally to the United States with his son Rafael Eduardo “Ted” Cruz. So how was it that Ted Cruz got right into the Bush Family Cabal so easily? His father, Rafael had favors to be paid back. Allen Dulles is long dead, but George Herbert Walker is still alive…and GHB knows Ted Cruz very, very well. What’s the normal background info for the photos? 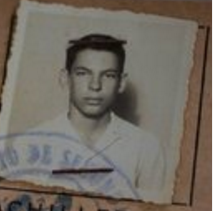 On May 29, Oswald ordered the following items from a local printer: 500 application forms, 300 membership cards, and 1,000 leaflets with the heading, “Hands Off Cuba.” According to Lee Oswald’s wife Marina, Lee told her to sign the name “A.J. Hidell” as chapter president on his membership card. On August 5 and 6, according to anti-Castro militant Carlos Bringuier, Oswald visited him at a store he owned in New Orleans. 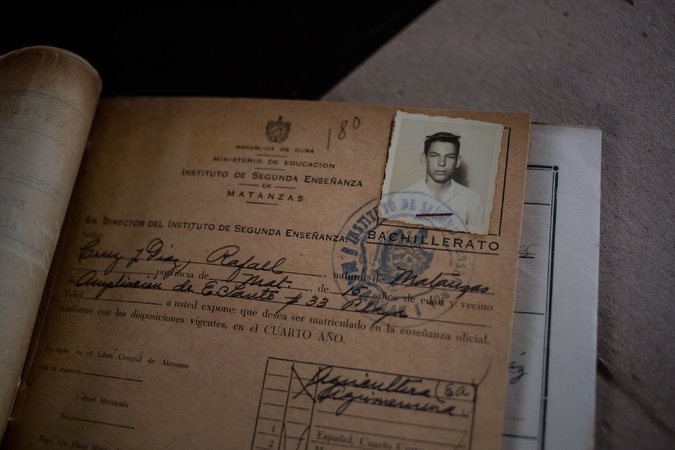 Bringuier was the New Orleans delegate for the anti-Castro organization Directorio Revolucionario Estudantil (DRE). Bringuier would later tell the Warren Commission that he believed Oswald’s visits were an attempt by Oswald to infiltrate his group. 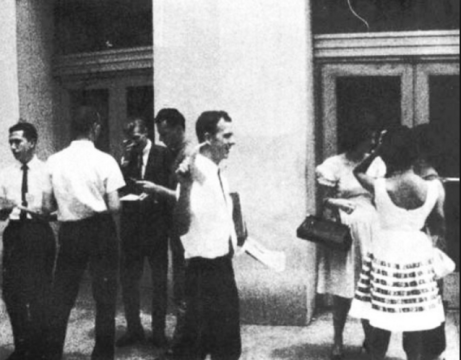 On August 9, Oswald turned up in downtown New Orleans handing out pro-Castro leaflets. Bringuier confronted Oswald, claiming he was tipped off about Oswald’s leafleting by a friend. A scuffle ensued and Oswald, Bringuier, and two of Bringuier’s friends were arrested for disturbing the peace. 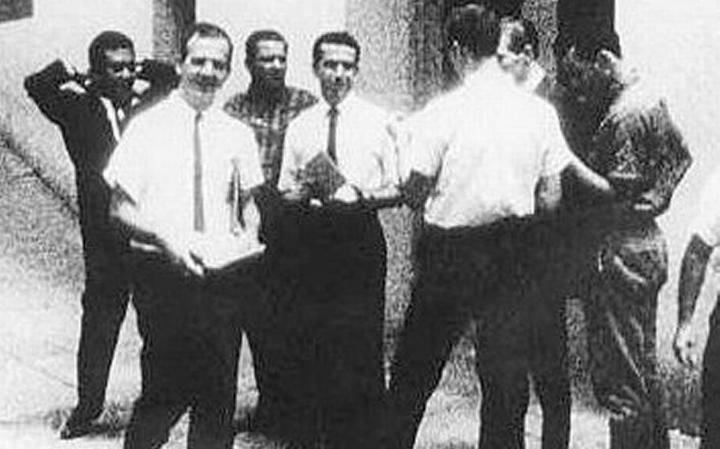 Prior to leaving the police station, Oswald requested to speak with an FBI agent. 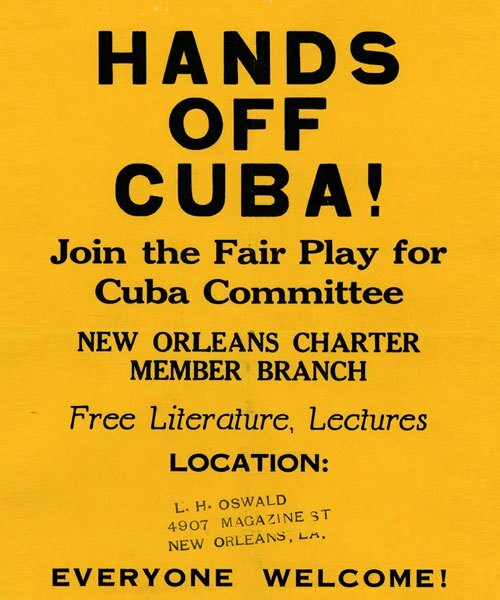 Oswald stated that he was a member of the New Orleans branch of the Fair Play for Cuba Committee which he claimed had 35 members and was led by A. J. Hidell. In fact, Oswald was the branch’s only member and it had never been chartered by the national organization. 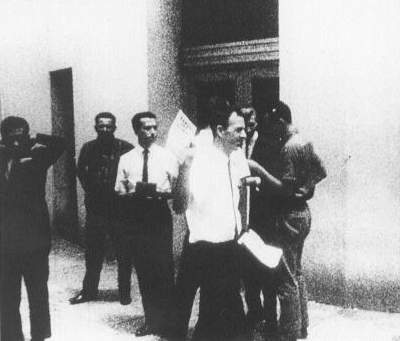 A week later, on August 16, Oswald again passed out Fair Play for Cuba leaflets with two hired helpers, this time in front of the International Trade Mart. The incident was filmed by WDSU, a local TV station. The next day, Oswald was interviewed by WDSU radio commentator William Stuckey, who probed Oswald’s background. A few days later, Oswald accepted Stuckey’s invitation to take part in a radio debate with Carlos Bringuier and Bringuier’s associate Edward Scannell Butler, head of the right-wing Information Council of the Americas (INCA). Source. But was it the right Cruz? On August 9, 1963, Lee Harvey Oswald was arrested on Canal Street in New Orleans and charged with disturbing the peace. The arrest was the result of a confrontation with anti-Castro Cuban exile Carlos Bringuier and two of his associates, Miguel Cruz and Celso Hernandez. Oswald was handing out pro-Castro leaflets when Bringuier, Hernandez and Cruz approached him. When Hernandez tried to take the leaflets from Oswald, a shouting match began; the New Orleans police then intervened, arresting all four individuals. Source. Miguel Cruz was a Carlos Bringuier associate. The Cruz photographed is one of the people that Oswald “hired,” correct? Was he Rafael Cruz? What Cruz is who? Oswald was the “president” and only member in New Orleans, with the address as “544 Camp Street, New Orleans, La.” This was directly across from Lafayette Square, New Orleans, the center of the intelligence network in the city. The Fair Play for Cuba Committee (FPCC) was organized by Robert Bruce Taber in 1960. It was an activist group set up in New York in April 1960, not New Orleans or even Florida. The FPCC’s purpose was to provide grassroots support for the Cuban Revolution against attacks by the United States government, once Fidel Castro began openly admitting his commitment to Marxism and began the expropriation and nationalization of Cuban assets belonging to U.S. corporations. The FPCC opposed the Bay of Pigs invasion of 1961, the imposition of the United States embargo against Cuba, and was sympathetic to the Cuban view during the Cuban Missile Crisis of 1962. Subsidiary Fair Play for Cuba groups were set up throughout the United States and Canada. Among its twenty-nine early notable supporters were William Appleman Williams, Norman Mailer, Truman Capote, James Baldwin, Jean-Paul Sartre, Allen Ginsberg, Lawrence Ferlinghetti, Waldo Frank, Alan Sagner and Carleton Beals. The Fair Play for Cuba Committee has been the subject of much speculation. It was accused by some of being a Soviet front, with little real support outside of a few dedicated American communists. However, it seems to have been connected to the Trotskyist Socialist Workers’ Party. The FPCC achieved notoriety through the activities of Lee Harvey Oswald in New Orleans. Oswald would later be accused of the assassination of President John F. Kennedy. Vincent T. Lee shut down the national Fair Play for Cuba Committee in December 1963 when its landlord evicted the group from its national office; the notoriety accorded to it, following the Kennedy assassination, made it impossible for the committee to continue its work. The group continued to exist in Canada and still published several pamphlets until late 1964. Source. 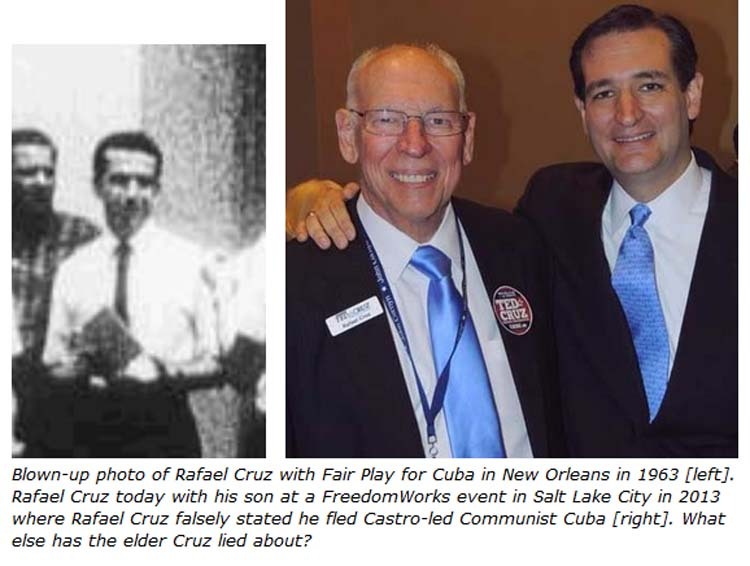 What is the real history of Rafael Cruz, his travels, and his links to Cuba & the CIA? 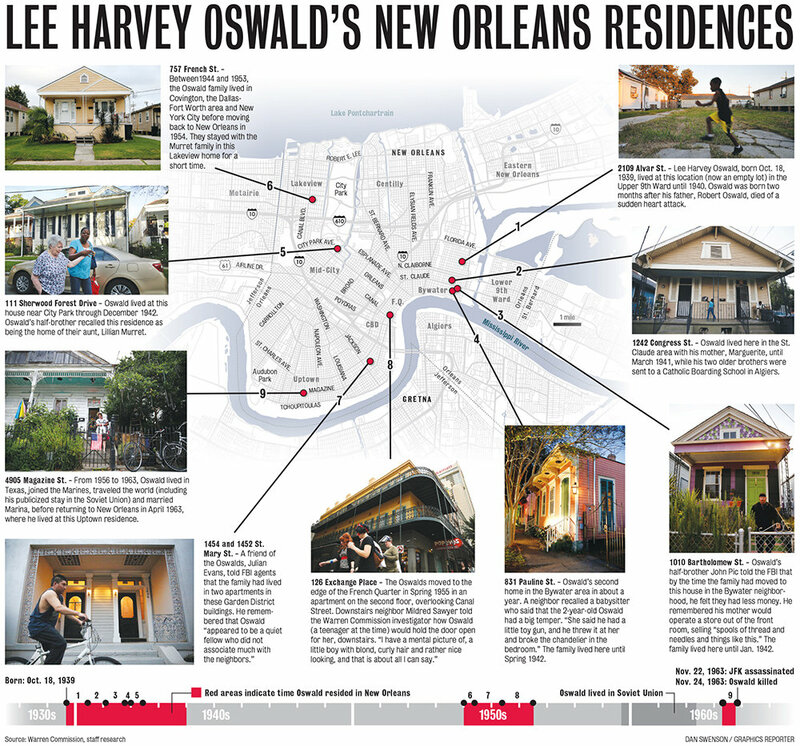 Where did Lee Harvey Oswald live in New Orleans?